I find this a good time of year to go out and take a look at the little things. The light is coming back and the temperatures are warmer, but the larger vascular plants have yet to obscure the little things with their towering structures of stem and leaf. I went for a short walk this evening and took along my macro lens and flash, thinking there might be some bryophytes or lichens that I could photograph. There were many small things that caught my eye this evening. There were a couple of different mosses, but most of the bryophytes are still showing the effects of last week’s weather. It is not so much that the weather was cold, but rather that the moisture was minimal and little has fallen since the temperatures have warmed up. There was some black cup fungi and a single small bird feather; but mainly it was the lichens, always abundant and seemingly impervious to all kinds of weather, that ended up being the primary target of my camera this day. There are not many lichens I know by name. There a few I think I recognize by sight, but that can be a problem with lichens; it is my understanding many species cannot be distinguished without chemical tests. I plan to try to learn the lichens by attempting to find, photograph, and identify as many different species as I can. It remains to be seen whether this approach, which has served me fairly well with vascular plants and birds, will work for the lichens. I will be happy if it gets me a good start down the road to recognizing the lichens. This entry was posted in activities, bryophytes, flora, lichen, photo, weather. Bookmark the permalink. Just stumbled onto your site and read a couple of entries. I like your writing style and the fact that you take pictures for your journal. I learned the name of the pixie cup lichen from your picture – I photographed some in Western Maryland on vacation and have been fascinated with lichens since. Have fun exporing and keep writing up your observations and pictures. Thanks for the note. If you are interested in lichens, I would recommend the book Lichens of North America. It is definitely not a field guide, but has lots of very nice photos as well as descriptions of the various lichens. 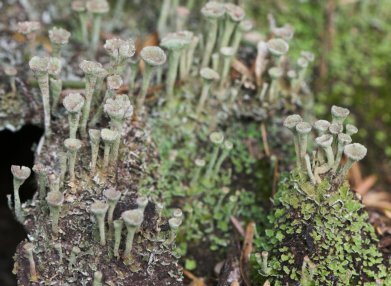 There are actually a number of different lichens that look like ‘pixie cups.’ I think they are pretty much all in the Cladonia genus, however. Matt– if you have photos (especially of macrolichens), I can try to help. Or you might check out my site onColorado Lichens, as I’m sure we share many species. (I’ll be getting back to work on that one of these days, I just know it!) I love the book you mentioned– assume you’ve also been to http://www.lichen.com, the related website, which has many terrific photos. Thanks for the offer of help. I know that lichens can be quite challenging to identify. One advantage I have is a reasonable checklist for the lichens in the region, and a fairly reasonable sub-list that I’ve compiled of the lichens known to occur here. I’ll be adding those names to my Life Section before too long.